Wild Turkey Hunting & Management. A 390 page hardback book with more than 200 illustrations. The 12 chapters cover TURKEY BIOLOGY, LIFE CYCLE, BEHAVIOR, VOICE AND CALLS, CALLING TECHNIQUE, MAKING AND USING THE WINGBONE YELPER, FIELD SIGN INTERPRETATION, TURKEY HUNTING WEAPONS AND SKILLS, HUNTING THE GOULD’S WILD TURKEY, TURKEY MYTHS & MISCONCEPTIONS, TROPHY PREPARATION, PHOTOGRAPHING AND AUDIO RECORDING TURKEYS, AND CONSERVATION & MANAGEMENT. 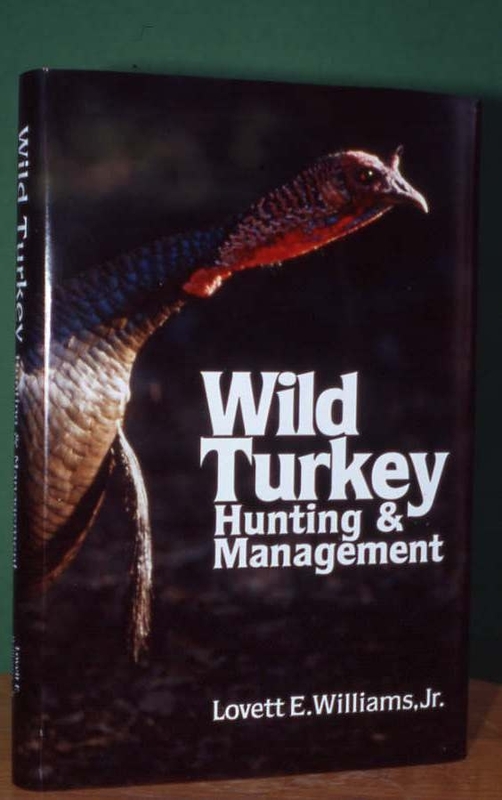 A definitive work by Lovett Williams on the subject of wild turkey hunting and management. Read excerpts from the dust jacket and the preface.
.:| After the Hunt with Lovett Williams | The Book of the Wild Turkey | Studies of the Wild Turkey in Florida | Wild Turkey Country | Wild Turkey Hunting & Management | The American Wild Turkey | The Wild Turkey and Its Hunting | Tales of Wild Turkey Hunting | Hunting the Gould's Wild Turkey in Mexico | Hunting the Wild Turkey |:.